Today I bring you more proof that my family and I do not subsist on salads and sweets alone. We actually enjoy simple suppers that include beef, chicken, pork, or seafood. I did plan our meals this week, but when I awoke yesterday to snow on the ground, I decided that Sweet Potato Skillet could be shifted to another night. We would stay at home and use ingredients that were already in the house. After searching high and low for a sloppy joe casserole that was gluten and dairy free, I made my own version for supper last night. 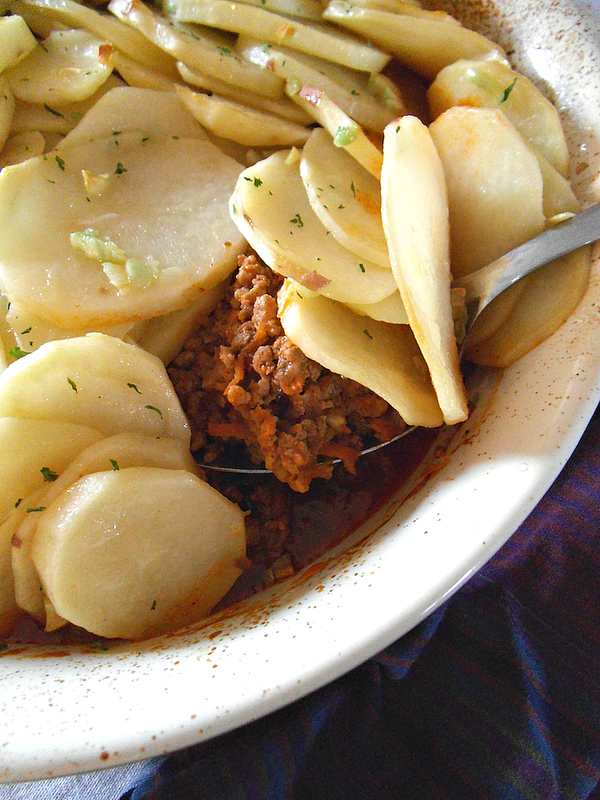 My family loves it when I make garlic potatoes as a side dish. Why not put them on top of a casserole? Though I’m not against regular buns, I was still recovering from eating a few too many Resurrection rolls over Easter weekend. Potatoes turned out to be a terrific topping! I could have sprinkled on a little bit of cheese, but the potato slices are so flavourful with just garlic, salt, and olive oil, that we didn’t miss the dairy. Go ahead and add cheese if you like though, and tell me what you think! In a large skillet, heat a small amount of oil over medium heat. Saute onion for 2 minutes before adding meat. Brown meat, stirring frequently. Add cabbage and carrots and cook for 2 minutes. Mix together ketchup, vinegar, Worchestershire sauce, and garlic salt. Stir into browned meat and let simmer for a few minutes to blend the flavours. Adjust seasonings to taste. Turn off heat. Preheat oven to 400 degrees F (200 C). Mix together olive oil, garlic, and sea salt in a medium bowl. Add potato slices and toss to coat. Into a 2-litre (2-quart) baking dish, pour seasoned sloppy joe meat. Top with potato slices, overlapping them in circular rings. Pour any remaining olive oil and garlic on top. 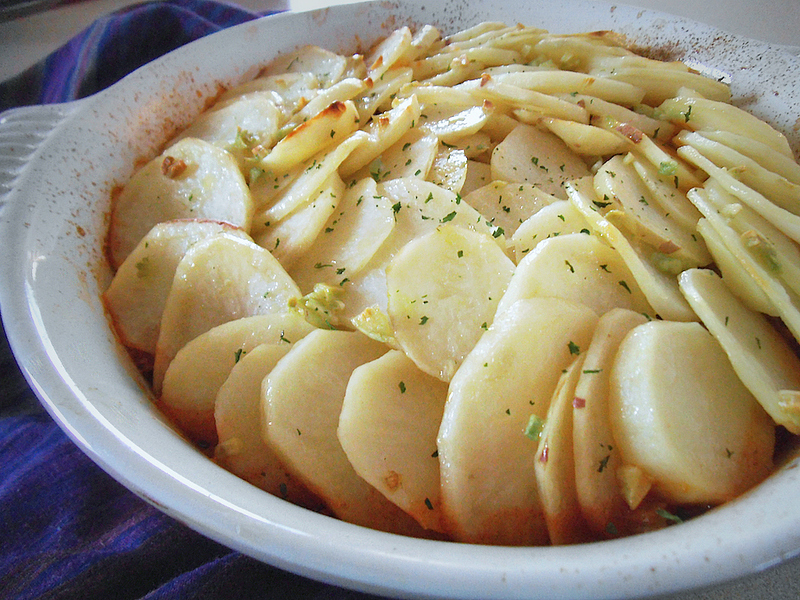 Bake the assembled casserole for 35 to 45 minutes, until potatoes are cooked through. Serve warm. I share recipes here, at Allergy Free Wednesday, and Gluten Free Wednesday. What a delicious-looking creation! I love potatoes but for whatever reason, I don’t cook them very often. This looks so hearty and flavorful. Yum! 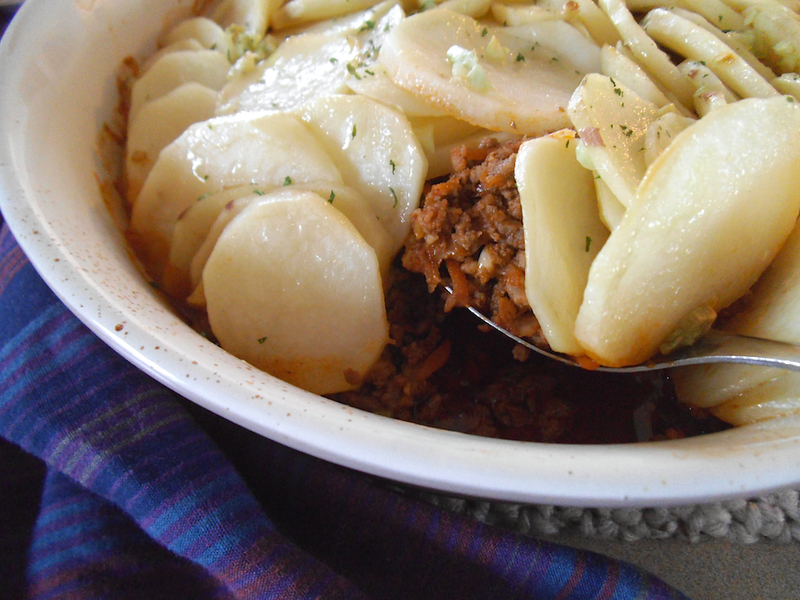 You can also make the garlic potatoes separately (in the oven or microwave). My kids love them! I have 3 grown sons who will be all over this! Will you add cheese then? Thank you for posting this. It gave me the idea I needed for the school lunchbox (really a thermos) today. Glad to hear it! I hope you enjoy it! Wow! 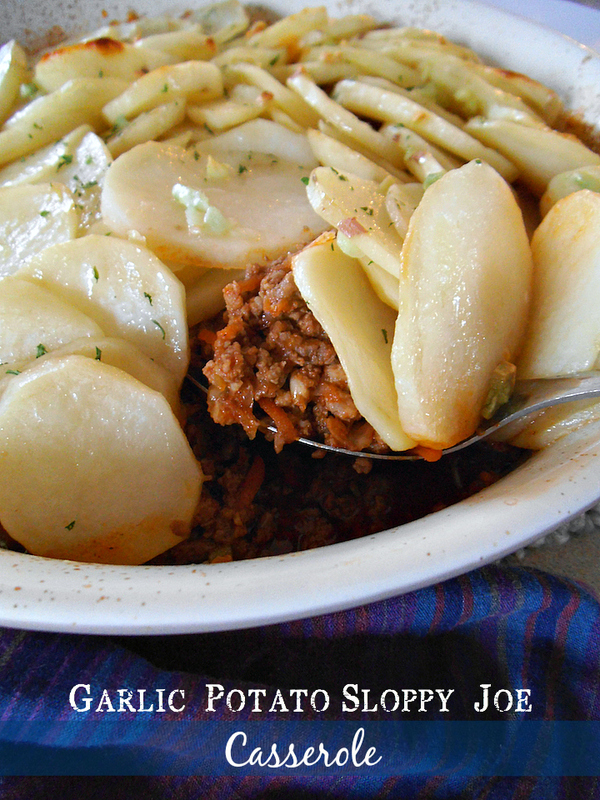 Looks amazing and I love the idea of potatoes with the sloppy Joe mix! Thanks! My husband was happy to get the leftovers for lunch! This looks amazing! Thanks for stopping by my site earlier! 🙂 We have been in Saskatchewan for almost 3 years now, and are living in a small village right now. Us too! 🙂 Except we moved up from the States.